Recently, I got a jar of peanuts and candy corn with a label “This may sound corny, but I’m nuts about you!” I loved the jar for several reasons. One — I love candy corn, and two — that was a teacher appreciation idea I posted last Fall. Around here, we don’t just post for the fun of it; we really want the ideas we post to be useful in your ministry. Today I’m sharing an idea that I used to tell my team here at work how much I loved them! I resized my labels to get 6 on a page in a Word doc. You can do this or just print the size that they are in the PDF file. Punch a hole in the top of each label. You might want to write a personal note on the back. Use the jute twine to attach the label to the stem of the pumpkin. Deliver and watch your volunteers’ faces brighten! It’s so important to tell the people who are working in ministry with you that you love and appreciate them. 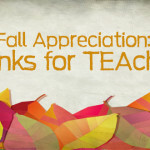 For 5 more fall-themed teacher appreciation ideas, click here.